Savoy Brown, Tramp, Dr. Feelgood, Livin’ Blues, Brunning Sunflower Blues Band and more. The Captain Maniac Show is back (we were off for a week), so this will be our first show from our new studios in downtown Guildford, Surrey BC. To start things off properly, we're gonna “go for what you know”, as Pat Travers so aptly put it in one of his album titles. 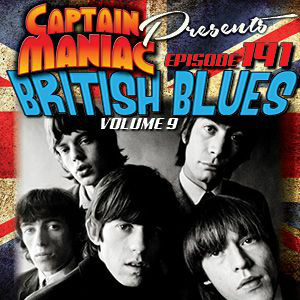 In Episode 141, we hereby present a return to The British Blues, with long-forgotten tracks from that golden musical bygone era of the 1960s and 1970s. Naturally, the Rolling Stones are featured (hell, that's them on the show artwork), with tunes from John Mayall, the Animals, Them, the Pretty Things, the REAL Fleetwood Mac, and many more proponents of that good old mindless boogie! (Yes, Status Quo is buried in there somewhere). Note: one of the tracks is "Warning" -- not the Black Sabbath interpretation, but instead, the original version by the Aynsley Dunbar Retaliation. Bring it on home!